It feels like quite a long time since I wrote anything. I do not make any apologies for it. I have had to work rather harder than I would wish and have been out just enough to stop me from being a total saddo. I also have had a huge case of writer’s block. Unfortunately, there is no publisher to chivvy me along or pay me for that matter. It’s actually been so bad that I have got rather desperate. 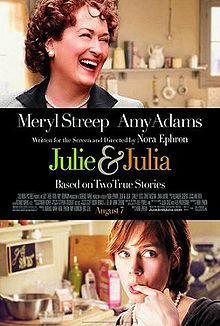 Inspiration has been found in rather a twee movie called Julie and Julia. It tells the true life story of a woman who has a crummy job. She makes her life rather more interesting by laying down the gauntlet to follow through the five hundred or so recipes written by Julia Child in “Mastering the Art of French Cooking”. She writes a blog as she goes. And, as if in a fairy tale, someone publishes it and they make a movie about it with Meryl Streep in. It’s ok as these films go. The Meryl Streep bits are better than whatever soppy girl played the bloggess. The blog is rather good, though it is a bit repetitive. I also find it rather hard to believe she could make pastry but had never boiled an egg before the whole project began. Her husband must also be a very nice man. No man I have ever spent any amount of time with or indeed have ever known, would tolerate that quantity of dodgy quiches for supper. I decided that perhaps there was a way of mimicking this success story, whilst giving it a fishy twist. I also desperately need something to do. I miss the river, I miss the sunshine. I am really cold. Flyfisherlady Terrace is under six inches of snow. My best friend has just got engaged and consequently I am dieting. There's something rather tragic about a fat, single lass at a wedding. I don't want to end up crying behind the marquee shovelling stolen wedding cake down me like a bulimic. 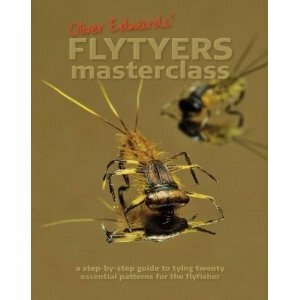 I bought myself a copy of Oliver Edward’s “Fly Tying Masterclass”. These are beautifully illustrated patterns for the advanced tyer. They also make rather lovely semi-realistic flies. Not quite Art on Hook, but a sloppier, marvellous Yorkshire version. It is really complicated, I don’t understand the names of most of the chapters “Heptagenid Nymph” and the” Ryachophilia Larva” are ones which stick out. I honestly don't think I can do it. So, the challenge: All twenty patterns from Ollie Edwards by the end of March, in no particular order. Oh and b*****ks to it. A good dress size down as well. Ha! What have I got myself into? So without further ado, I shall do my best to do as Edwards says. “Just follow the sequence drawings, fix the route in your mind, have the correct materials to hand and- with a little practice- you’ll produce flies identical to the ones in my box”. Hmmm…. I received an email last week and I have been pondering it ever since. I was asked, "Are you trying to place yourself as a role model for female anglers everywhere?" Crikey. I am bad at keeping to budgets, horribly messy and leap frog between one self-induced chaotic crisis to the next. I don't deal with customer service departments very well. I am terrible at dating and recently I seem to be quite taken with ridiculously unattainable and inappropriate men. As an angler, my casting is pretty rubbish (but getting better) and I catch very few fish. Not a sensible model to follow to say the least! So, I got to thinking*," Why do female Anglers need Role Models?". Granted, there are fewer of us but why does that mean we need something to orbit, flit around and worship? Fishing isn't something done against the odds, it's not winning a Nobel Prize and it isn't climbing Everest. Spending a day pottering on the riverbank is hardly an achievement. It's a nice day out. Competition fishing is different. I would love to know why there are separate Ladies' and Men's competitions. It's not as if they make Ladies fly-fishing rods. I do not want this to detract from the achievements of our lady competitors, particularly as all recent competitions seem to be won by British Women. It would please me in so many ways to see a woman beat John Tyzack at his own game. I love the idea that some sparky femme would do this in disguise, preferably looking a little like Robin Hood in green tights. She would cast away all day, possibly wearing a fake moustache and probably looking a little camp but no one would be aware of her womanliness. Then, when the final whistle is blown, when she is announced as the winner she would slip off her disguise, revealing a sparkling frock and bursts into song, preferably something by Shirely Bassey. That would prove once and for all that the distinction is ridiculous. There are other women who champion women's anglers. A particular favourite of mine is the Fisherbabe. She wears Victoria Secret under her waders apparently. She is a bit of a bombshell and argues that you can be girly and still fish. I do wonder who she is trying to please though. Being a brunette I have an inherent distrust of blondes and wonder if she is not too much of an unattainable model to follow. So I'll stick to Marks and Sparks thanks. There seem to be some amazing lasses from the North East. Lucy Bowden and her Fly Fishing for Everyone Ladies' club and Ladies Fishing have created two female friendly clubs where women can be themselves and fish. So much of me wants to join. However, as I perceive there to be no inequality between men and female anglers I think I would be hypocritical of me to do so. Then again, I have an entire family to support my angling life. I can imagine for a lot of women turning to aging male anglers for advice and indeed spending hours in remote places with strange men could be quite frightening. So providing a safe environment for ladies to take up the sport is a huge achievement. So, there are better women to follow than I. Ideally I would like to blend in. I understand that girls on the riverbank are a bit novel and we are bit different and I think this is a real shame. Anything that can be done to change this would be brilliant. I am not a female fly fishing messiah and I really don't want to be. I will do my bit for the female race of anglers though and state two things that every (fishing) woman wants. Women's waders are either expensive or hard to find. I wear men's rubber waders and they are horrible. The crotch hangs between my knees and the chest part comes over my head. Not that I hope to attract anything but trout when I fish but there is no need for anyone to look this frightening. A little bit of cover. River keepers of Britain, please consider that although most ladies are happy to take comfort stations outdoors they would appreciate the odd little thicket to do so without traumatising/thrilling those around them.